PLANET MERCURY. The innermost planet of the Solar System and the smallest, Mercury is only a little larger than the Earth's Moon and has a temperature of very hot to freezing over day\night. PLANET VENUS. The second planet from the Sun and the closest in size to the Earth. There the similarities end with a surface temperature of 460C and crushing gravity. PLANET EARTH. The third rock from the Sun and accompanied by 1 moon. It takes the Earth 365 days to make one orbit of the Sun and 24 hours to rotate through day and night. PLANET MARS. The 4th planet from the Sun and the second smallest. Mars is a rocky planet with a thin atmosphere composed primarily of carbon dioxide. Mars has two small moons, Phobos and Demos. PLANET JUPITER. A gas giant planet and the fifth from the Sun. Jupiter has raging storm known as the Great Red Spot. It has 79 moons and the 4 largest are visible through a small telescope. PLANET SATURN. The jewel of the Solar System with a system of rings made from small particles of ice. Jupiter also has over 60 moons, and one of its largest moons Titan, has lakes of liquid Methane. PLANET URANUS. The seventh planet from the Sun Uranus is another gas giant with the unusual feature of rotating on its end instead of at its equator. PLANET NEPTUNE. 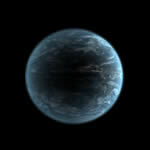 The eighth and final planet. Neptune is also a gas giant though not as big as Jupiter or Saturn. 14 moons has so far been discovered around Neptune. Jupiter's moon Io is the most volcanically active planet in the solar system, with hundreds of volcanoes, some erupting lava fountains dozens of kilometers high. What a space probe land on Io's surface. The rings of Saturn are the most extensive ring system of any planet in the Solar System. They consist of many small particles, from mm to m in size are made almost entirely of water ice. If the Moon were replaced by Jupiter! Watch as the giant gas planet Jupiter rises above the Australian city of Perth in this timelaps video. If the Moon were replaced by Mars! Watch as the planet Mars rises above the Australian city of Perth in this timelaps video. First EXOMOON discovered! A moon orbiting an Exoplanet orbiting anothor star.